Do you remember the time when you last ran straight to pole dance workout and told your friends that you could not go to a barbeque as you have a pole dancing class, or counted down the minutes before the end of the day to quickly go to your favourite class? If this happens to you constantly, then you can close this post. If you suddenly realized that lately you have to force yourself to go into the studio, do not experience the joy of meeting with the pylon, skipped classes for the sake of going to the movies or shopping, then it’s time to examine the situation. First, find out the reason. Ask yourself the question: What are you training for? And then answer yourself honestly. Maybe it’s a tribute to fashion because everyone around goes to workouts. Maybe it is a desire to boast about an unusual hobby before friends, or maybe it is a momentary desire to be able to do the movements just as well as others without the willingness to spend time, money and strength on this. It is an imposed desire. The main thing is to recognise it in time and stop torturing yourself with workouts that are not interesting to you. 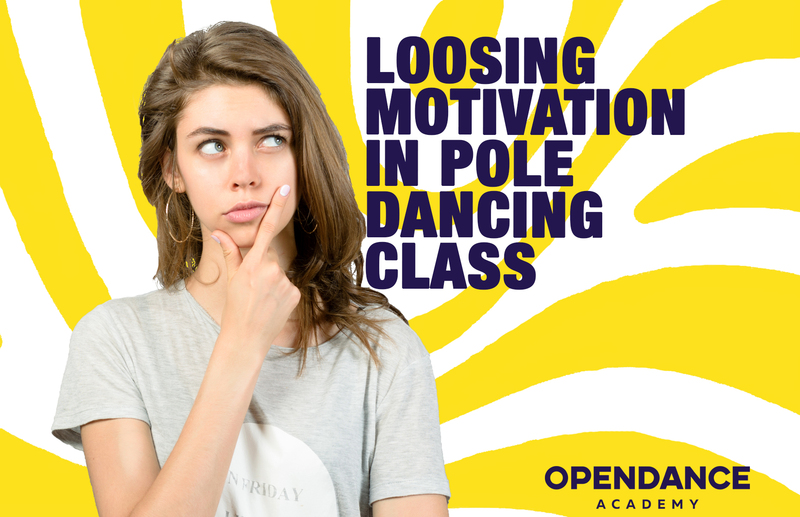 But if the pole dance really is interesting to you, but the training has ceased to bring pleasure, here are the possible reasons for the loss of interest in training and options to solve the problem. You are training at the wrong time. Everyone is unique, so listen to yourself. Maybe you are a typical lark but train late at night. The peak of your activity falls on the morning and by the evening you are too tired and the training takes the rest of your strength. Do not argue with your biorhythms, postpone the training for the morning or for your lunch break. Most athletes are familiar with the stage plateau when progress seems to have stopped. On the pylon it happens when the period of light tricks that are quickly being learned is over and more complicated tricks have begun. Complex tricks require much more time, strength, perseverance and special physical preparation. It seems to a person that they are stuck or they begin to think that pole dance is not for them, but it is a mistake. Take a closer look at the training process. Learn to enjoy not only the result but also the process of training. The process of working out tricks and performing exercises should not be a boring and routine activity for you. Enjoy every moment of training and then progress will accelerate. Find another coach. Do not assume that all the troubles are in the coach and in the case of stagnation you should immediately escape from them. Sometimes there are situations when the coach unconsciously and sometimes consciously inhibits the development of the student. Try to a couple of workouts with another instructor, perhaps this will help you to make the best decision for you. Some people are not interested in training just for training. It is important for them to see the goal to which they are going. Set an achievable goal and set a time frame. Make a plan that will help you achieve the desired result. For example, you set a goal to learn how to do a handstand or to make an act for a competition (Blog “Are You Ready For A Pole Dance Competion”). By the way, if your goal is not achievable like learning how to do the splits in 1 week, then this can demotivate you. There are many reasons for that, sometimes it’s the most common mope, it happens to creative people. Include variety in your workouts, add excitement to classes, negotiate with colleagues for some sort of challenge. For example, arrange a competition: every workout you do should work on X flag element, and at the end of the month compare who can hold it longer. Organize competitions, learn elements on a bet. Bring a game element into your training. Go to the master class, they are a real source of energy and inspiration and are able to charge a person for a year ahead. You are just tired of work, working days and workouts. Take a short vacation and soon you will feel that you are missing your favourite pylon. I hope that our guidance will help you get back your interest in training and you will please yourself and your friends with your new achievements!